NMM 12881. 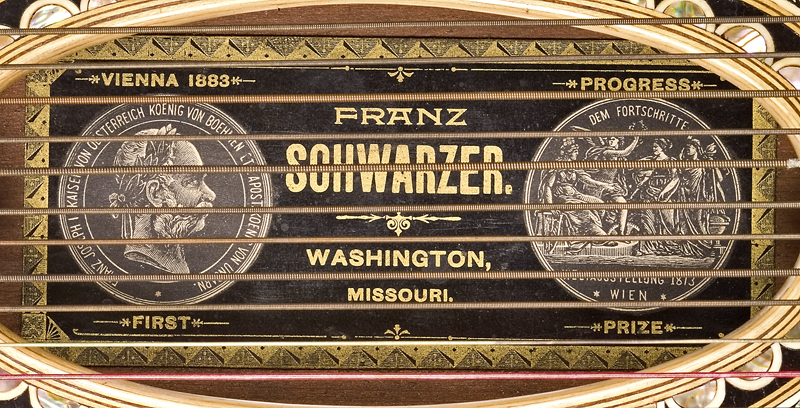 Alpine zither (Arion harp zither) by Franz Schwarzer workshop, Washington, Missouri, ca. 1920. Custom Special Arion Harp Zither; Mittenwalder Form. 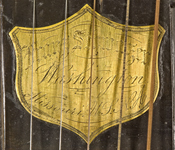 Serial number 10517. 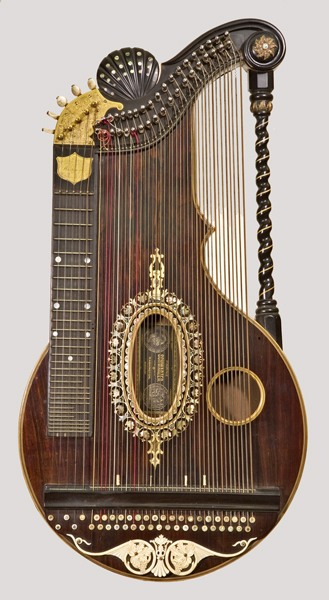 43 strings (5 melody, 38 accompaniment). 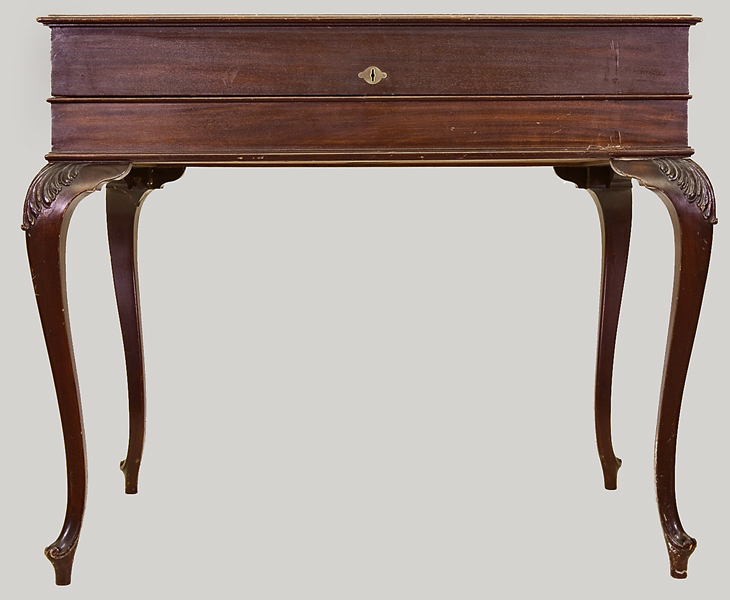 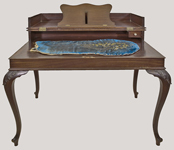 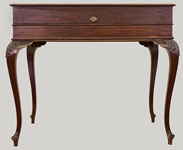 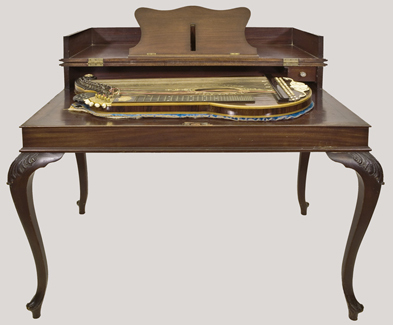 Original zither table. 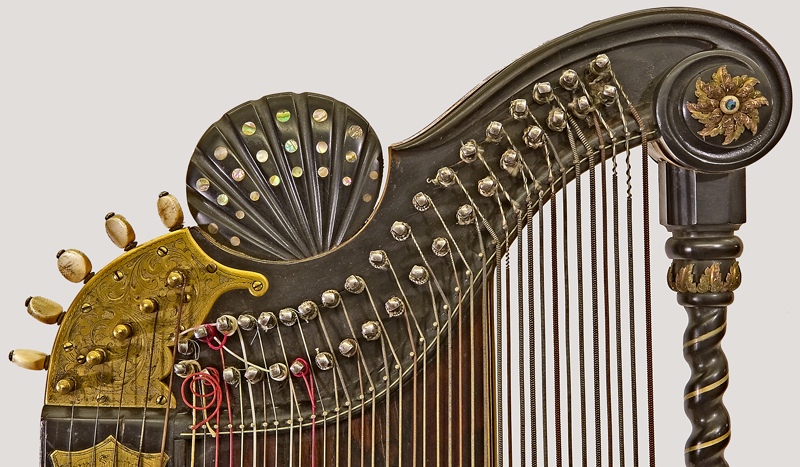 Custom built for Emma Wellisch, prominent zither virtuoso in St. Paul, Minnesota. 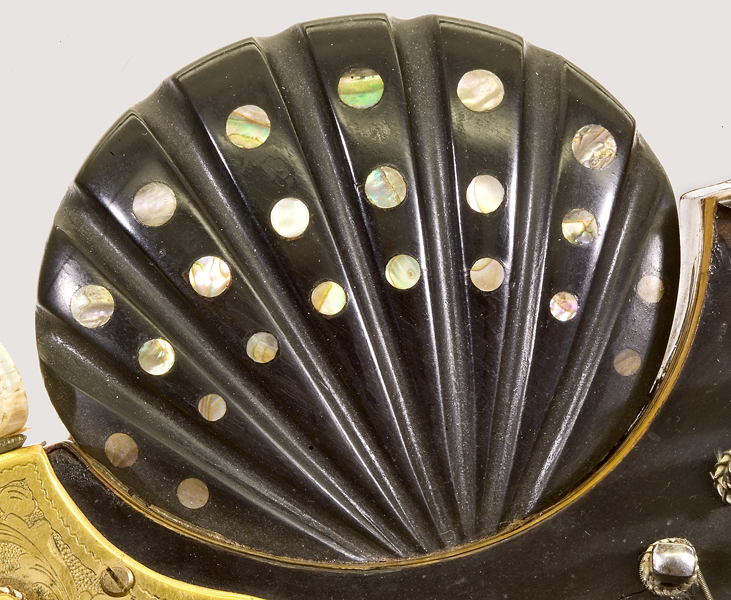 Ex coll. 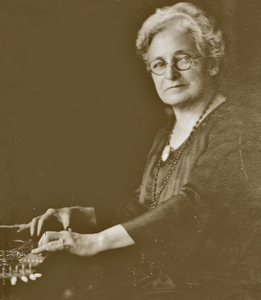 : Emma Wellisch. 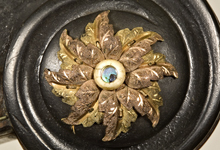 Paul and Jean Christian Collection, 2006. 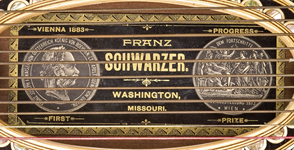 Franz Schwarzer (1828-1904) developed the Arion Harp Zither model in 1880, to produce greater volume and better tone than previous models. 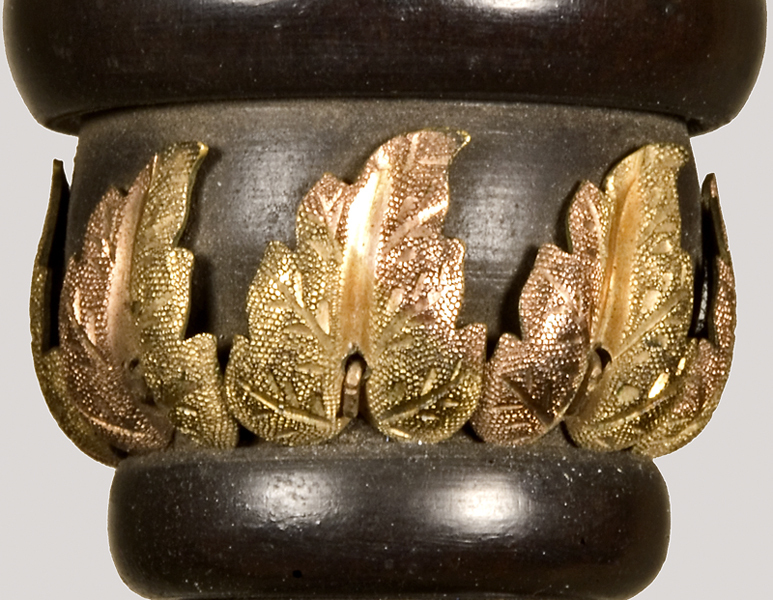 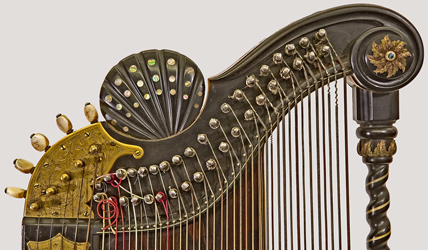 It has a large, round body that, along with the ornately turned pillar, is characteristic of Alpine harp zithers. 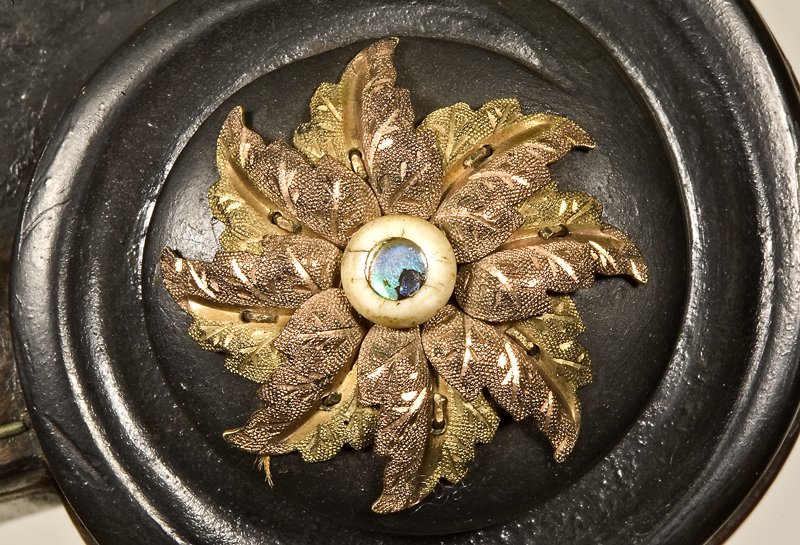 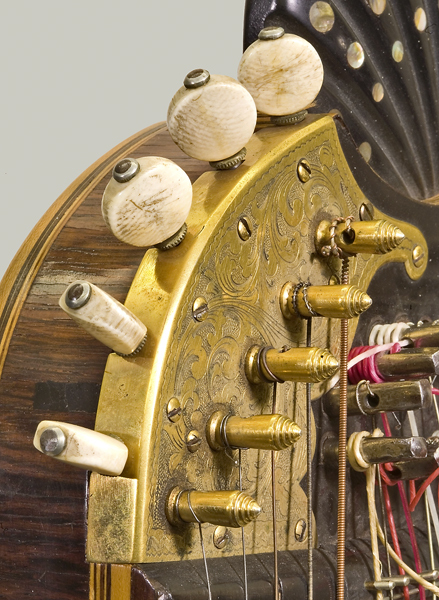 Inlaid with ivory and abalone, exemplifying the finest of the Schwarzer zither models, this instrument is preserved along with its original, ivory-handled tuning hammer, tortoise-shell picks, and a large collection of the original owner's music. 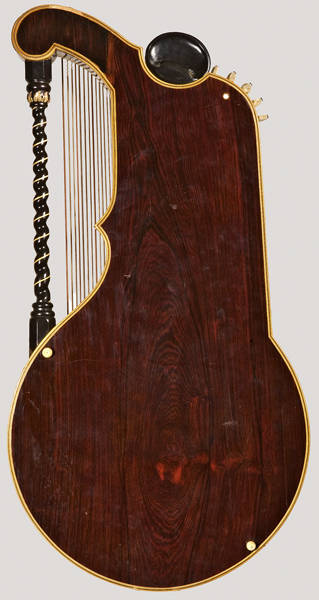 Materials used on zither include: rosewood veneer on soundboard and back; tulipwood veneer on sides; ebony scroll, spiral pillar, fretboard, and ornamental shell; abalone, mother-of-pearl, and ivory inlay; and, gold-plated peghead plate, shield, decorative leaves, and pillar spiral. 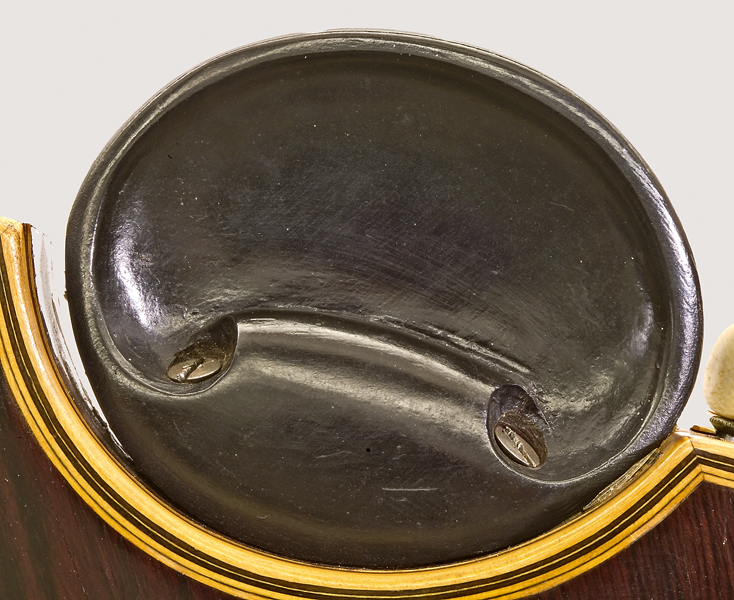 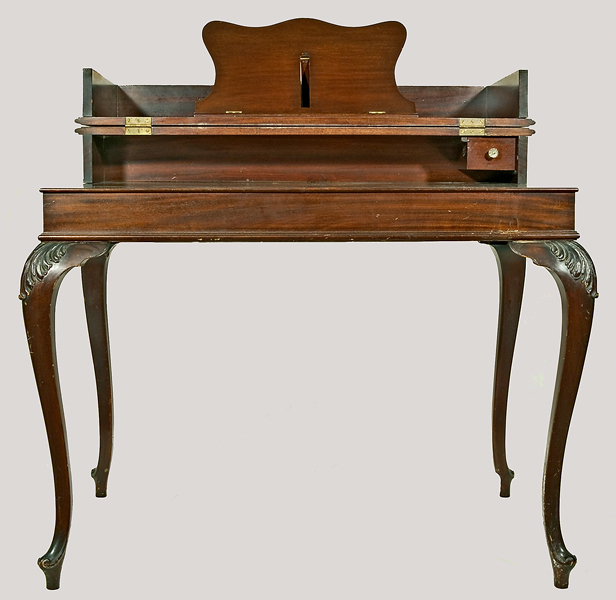 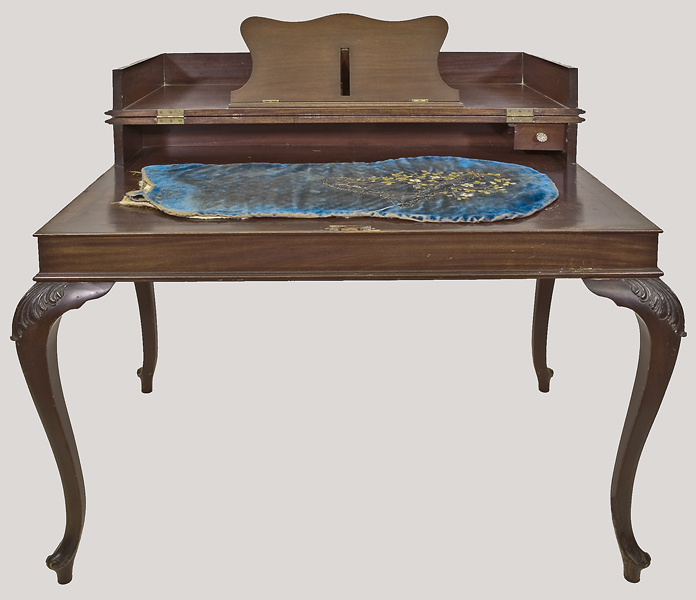 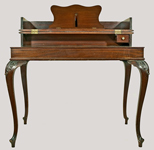 The instrument rests on a zither table designed by Schwarzer to embellish the zither's sound, as well as hold the instrument when being played. 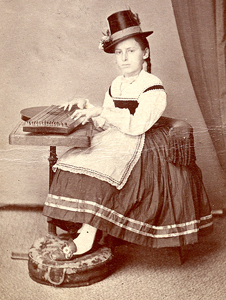 The original owner of this zither was Emelia ("Emma") Lawrence Wellisch (b. 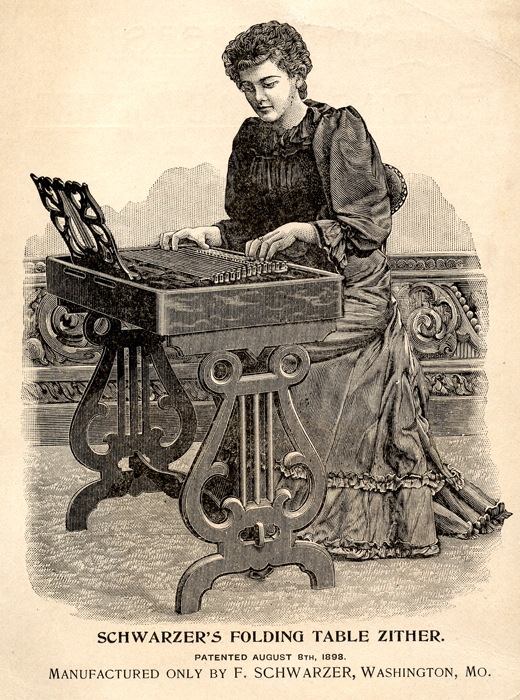 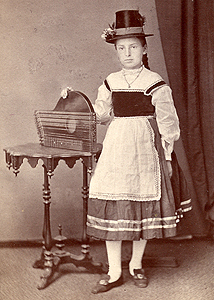 1862-d. 1951), a German-speaking immigrant, who began playing the zither as a child in the 1870s. 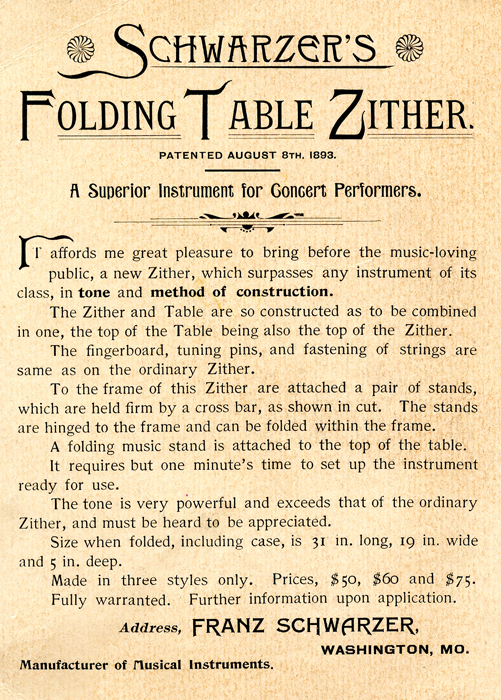 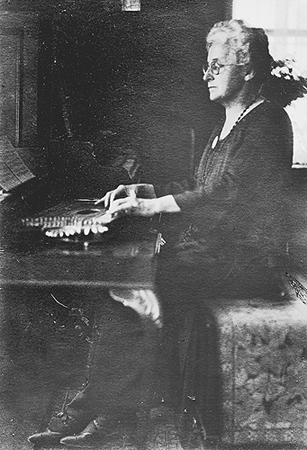 Wellisch later became a prominent zither virtuoso in the twin cities of Minneapolis/St. 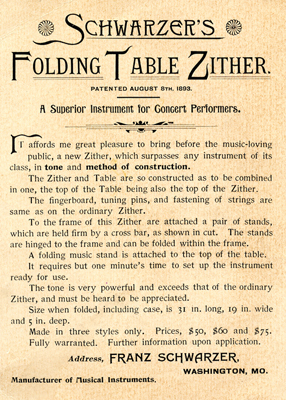 Paul and served in various administrative positions on the board of the Minneapolis Zither Society. 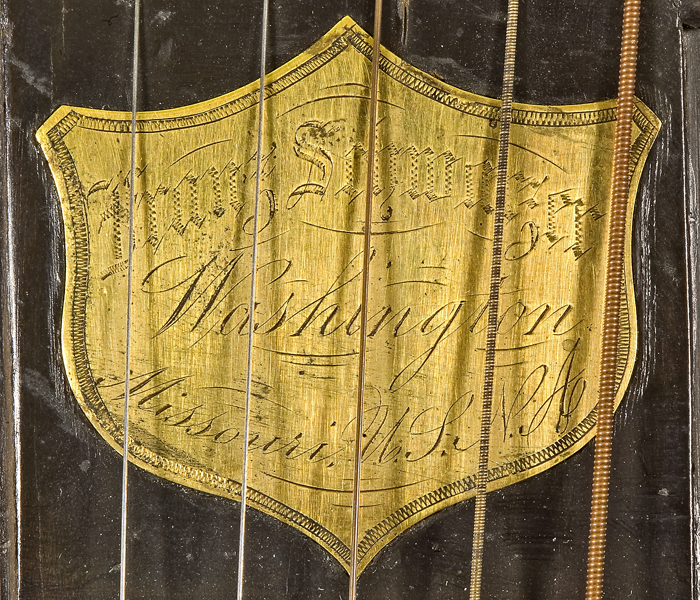 Literature: Darla Earnest, "Schwarzer's Arion Harp Zither Reflects Golden Era in USA," National Music Museum Newsletter 34, No. 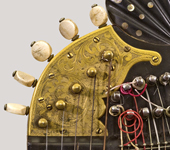 1 (February 2007), pp. 1-2.